We’ve all seen Man vs. Food. Most of us have probably felt slightly ill as Adam Richman has tackled mountains of food to win a free t-shirt or his name on the Wall of Fame in venues across America. 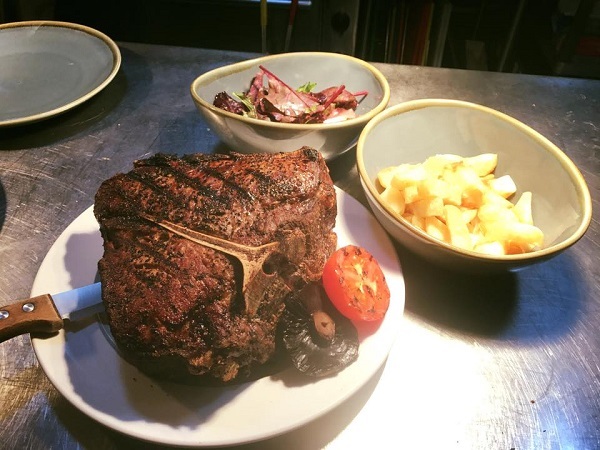 But for those who haven’t, and who think that they can conquer a ridiculously sized or a ridiculously spicy plate of food, there are plenty of places in and around Bristol that have thrown down the gauntlet. Prize: Your name on the wall of fame, and a winners’ or losers’ t-shirt, depending on how you fare. 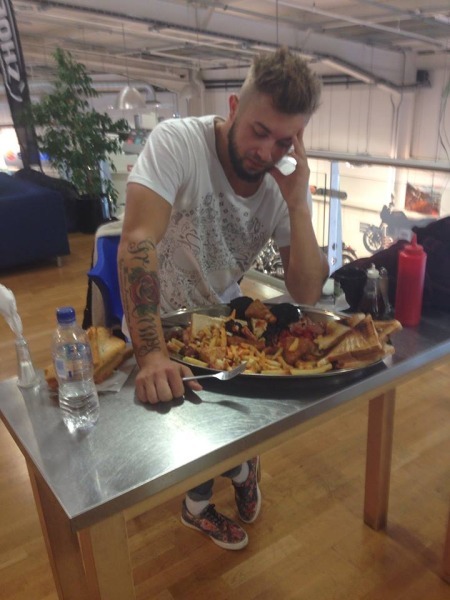 5lb 10oz of food. Come hungry. 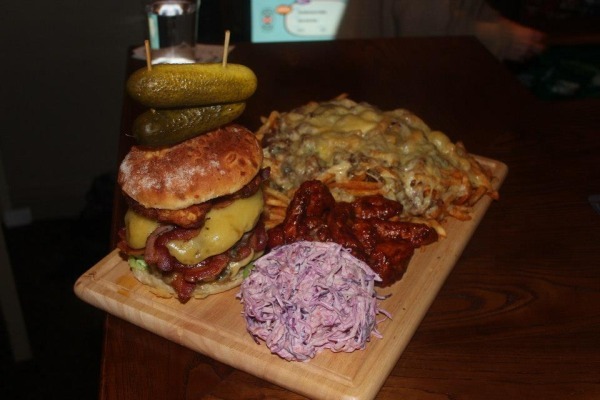 Instructions: Take down a Triple Bypass Burger (3 7oz burgers, 6 rashers of bacon, 2 hash browns, 2 huge pickles and salad), a huge heap of Dirty, Dirty Fries, 12 super hot wings, coleslaw, pickles and sauces to be victorious. Is your stomach up to finishing a triple burrito? 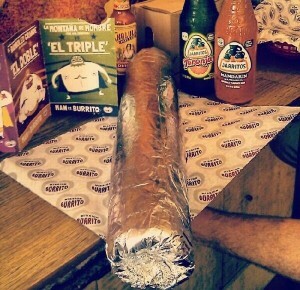 Instructions: Finish a 3lb burrito that features triple the number of tortillas, meat, rice, beans and other fillings. Prize: A free t-shirt and your name on the wall of fame. 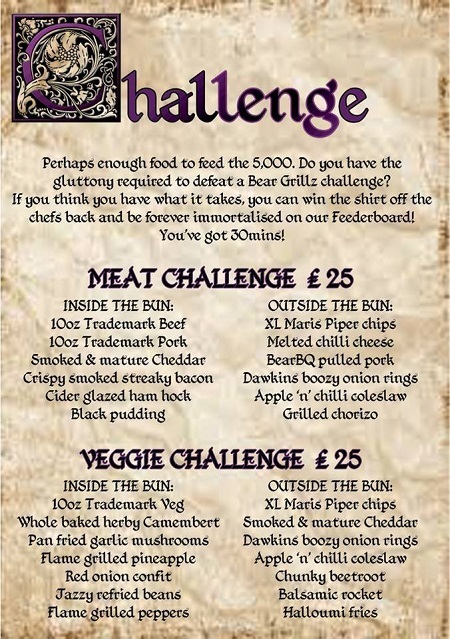 In their words: “The ultimate low ‘n’ slow BBQ meat feast”…they’ve now updated this challenge as it was too small before, so good luck! Instructions: One for carnivores. Demolish a plate of chicken, brisket, pulled pork and ribs, along with hot dog, fries, slaw, pickles, cornbread, BBQ beans, brisket chilli and burnt ends. 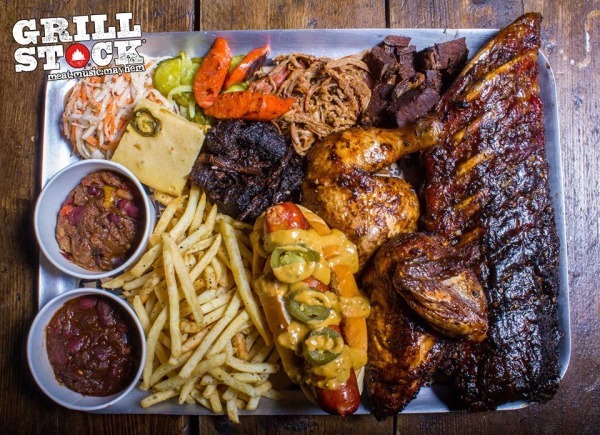 Prize: A free t-shirt and a bottle of Grillstock’s BBQ sauce. Prize: Your name on the online wall of fame, where entries are ranked from fastest to slowest. Prize: Your breakfast free of charge. 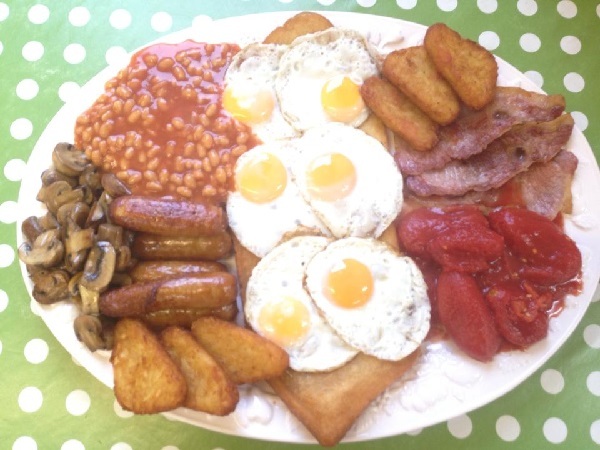 Instructions: Chow down on 6 rashers of bacon, 6 sausages, 6 eggs, 4 hash browns, 4 slices of black pudding, 4 slices of bread and butter, fried potatoes, mushrooms, beans, tomatoes, 6 slices of toast and 6 slices of fried bread. Complete in the allotted time, if you can! Instructions: The Marriott City Centre Hotel double dares you to take down this burger, which features two prime burgers, bacon, cheese, mushrooms, tomatoes, onions and lettuce finished off with seven onion rings and a basket of chips. Prize: A free pint to wash the burger down with. 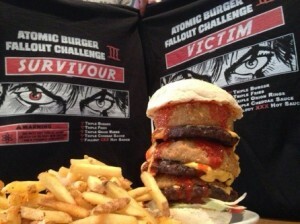 Do you have the gluttony required to beat their challenge…? Prize: The shirt off the chef’s back – and your name on the Feederboard. Instructions: Demolish a 2lb burger with 6 rashers of bacon, cheese, tomato, lettuce and onions. 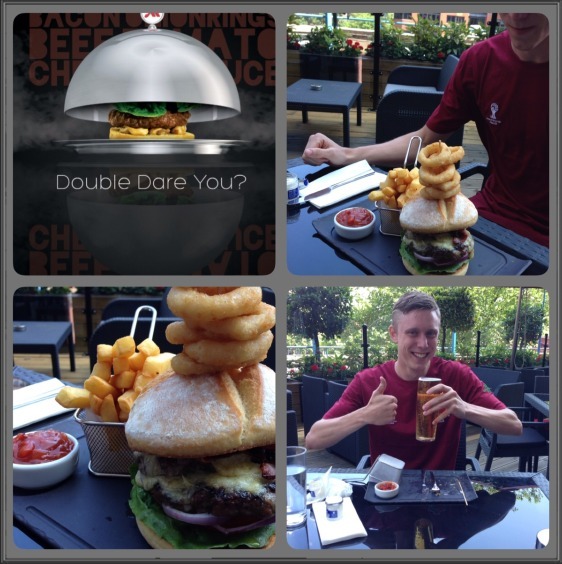 You’ll also have to chomp your way through a sea of chips and a huge tower of onion rings… Be sure to pre-book, as the buns are made specially for the challenge. Prize: A Hollywood challenge t-shirt, and your picture on the wall of fame. 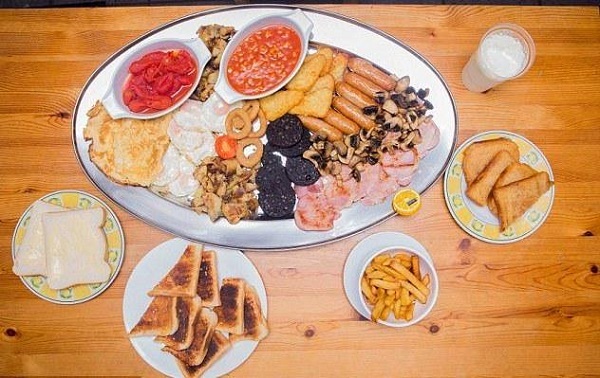 Instructions: Work your way through a breakfast that weighs in at over 8,000 calories: 6 rashers of bacon, 6 sausages, 6 eggs, 2x 3-egg omelettes, 4 portions of fried potatoes, 4 portions of mushrooms, 6 slices of black pudding, 6 hash browns, 1 bowl of chips, 4 onion rings, 4 slices of toast, 2 slices of fried bread, 2 slices of bread and butter, 1/2 grilled tomato, 2 portions of beans, 2 portions of tomatoes…and either a pint of milkshake (you choose the flavour) or a can of Monster! 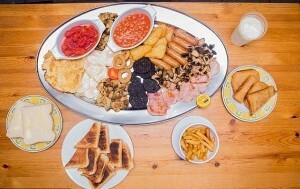 Prize: Your name and picture on their wall of fame, a free mega breakfast voucher, a mini trophy and a keyring. Prize: Your money back and your photo on their wall of fame. 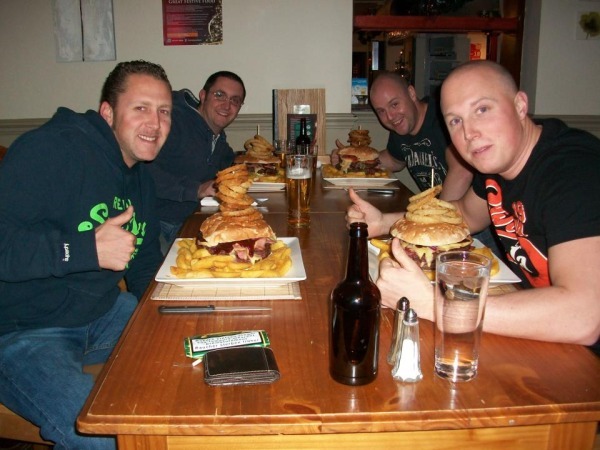 Can you tackle a monster fish and chip meal…? Instructions: A giant portion of fish, served with chips, mushy peas and a salad garnish. Prize: A certificate…and a free dessert. The kraken has a speed challenge try to eat dirty fries in less than 10 minutes prize:glory!!!! 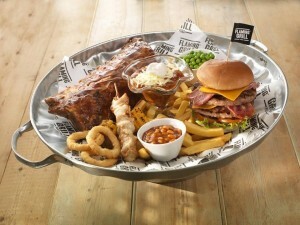 There is a large fish challenge in Weston on jonvsfood on you tube prize certificate and desert! 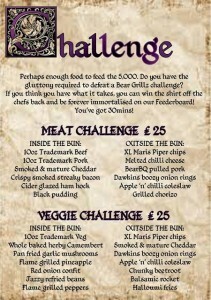 The Lodekka, (It’s a Hungry Horse Pub) on the Bath Road in Brislington has a Steak Challenge. They do a 40oz steak for £19.99 I believe. There is no time limit but it’s still a lot of steak. It usually comes with chips, peas and onion rings. If you are feeling adventurous you can even have an egg on top of the steak. Thanks Dan – now updated!